My Toilet Leaks Around the Base. Home / Lakewood Ranch Plumber / My Toilet Leaks Around the Base. A common problem with toilets is water around the base of the toilet. The first thing you want to do is to dry it up around the base. Then put toilet paper around the base, laying the paper flat. This will absorb water very quickly to help you determine exactly where the water is coming from. Have a flashlight handy because it is easier to spot a drip. Start by looking at the supply line that connects to the shut-off valve to the fill valve of the toilet. Sometimes the leak around the base of the water closet is coming from where the connection is made to the fill valve. If you find it leaking from the supply line, replace it with a stainless steel braided closet supply line. The fill valve shank could also have a hairline crack in it, so you may have to replace the fill valve too. If the leak is not on the supply line, check the bolts that connect the tank to the bowl. Look under the tank where you can see the ends of the bolts and look for drips. If the bolts are leaking or are rusted, ( steel and water don’t mix) replace the tank bolts with brass bolts. While you have the tank off, it is cheap insurance replace the tank to bowl gasket. These rubber gaskets dry rot over time and will cause leaks. Up to now, all you have done is checked for static leaks with the toilet tank full. If no leaks are found at this point of inspection, the next step is to flush the toilet. Sometimes the leak is between the tank and the bowl. If the tank to bowl gasket is bad, water will leak out, sometimes pour out when you flush the water closet. If this happens, replace the tank to bowl gasket, tank bolts (use brass bolts), and the supply line. After inspecting the water closet from the top down and finding no leaks on the toilet paper you have laid down, but when you flush the toilet water leaks around the base of it, this means the seal has gone bad. Or the toilet waste line has a stoppage and the back pressure has blown the seal. Does the water closet rock when you sit on it? It should be solid. If the seal is bad, you will need to pull the toilet and replace the seal. When the toilet is removed, check the closet flange to make sure it is not broken. If it is broken, the toilet will not bolt down to the floor securely, so it would need replacing also. When resetting the toilet make sure to use brass closet bolts. 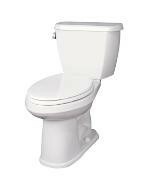 Sometimes, depending on the age and flushing action of the toilet, you are better off just getting a new toilet. We recommend Gerber Avalanche water closets with soft close seats. Need help? Call Wimpy’s Dependable Plumbing, Inc.. We serve the Sarasota, Bradenton, Osprey, Lakewood Ranch, Siesta Key, Casey Key, and Longboat Key. We also will take care of your plumbing needs in the Old Miakka community and Myakka City. Call 941-322-1911 or visit LoveYourPlumber.com to schedule on line. Bubba Butler and our team would love to be your plumber!